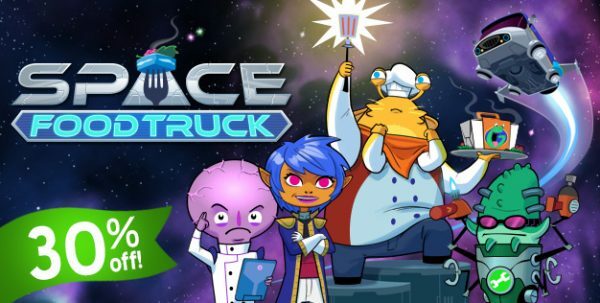 Space Food Truck, our 1-4 player co-op adventure card game is on sale starting today! If you still haven’t picked up a copy, or were looking for an excuse to pick up a copy for a friend there’s been no better time. At $7.99 this is the lowest price it has ever been on Steam and Humble! The sale runs through July 5th, and if you’re into getting 4-packs, you can now get the 4-pack for just $20.99 as well. For the folks that like gaming on the go, we’re also running a sale on iOS and Android where you can pick up a copy for $2.99 through July 5th! My game crashes on victory/loss right before the ship starts moving off screen. Occasional random crashes despite having closed all other apps. Probably jus my device having low RAM and hence not really fixworthy. Sft is cool and all but You should try outwitters. They are currently working on a new project called hexgambit. Oml is only 2 people. One is the artist and the other is the programmer. Alex is usually willing to work with people to fix any issues in a game, however the fixes take some time sometimes. It’s really just 1 person trying to work on a new game and keep 5? 6? Games running properly. Alex has the weight of the world on his shoulders. Usually if you need help with bugs or any issues you would probably want to ask Alex, but I’ll throw Adams name in here too just in case. Ps: it might help if you listed any exact problems you are having. Is it just lag and crashing? You mentioned bugs but never said specifically what they are. You probably won’t be able to get them to change the 1 minute rejoin timer, people have been asking for a confirm end turn button on outwitters for years. Maybe you will get lucky though. Welcome to the forums by the way, you stumbled on to a very special unique community. I’ve never been in such a great community as the one here. The forum users and outwitters players are all mature and nice. You will meet people from every different country in the world if you play outwitters long enough. I’ve made great friends with people from Australia, Italy, china, Brazil, Norway, Netherlands, Russia… the list goes on and on. Anyway, enjoy your stay. Edit: Outwitters is a mobile game :S and I see has microtransactions… hopefully its not p2w? i have the samsung galaxy s6 and i go to open the game and the logo for onemanleft is there, the google sign in level circle pops up showing me where I’m at now, and it just stays on the logo. It wont open the game. Edit: I tried reinstalling the game to no avail, then I restarted my phone and it now is working!